I have always emphasized that students and advanced players should be doing scales and arpeggios every day. You should know them well enough to incorporate them in your practice without needing music in front of you. That step may take a while, but it is not too difficult to achieve. I knew my scales by heart in high school (through 4 sharps and 4 flats per my school's requirements). Then to learn arpeggios, you build on the knowledge of scales. The Bb major arpeggio (or chord) is based on the 1st, 3rd, and 5th notes of the Bb scale, for example. So in the example below you see many examples of arpeggios using Bb/D/F . The first example below is the famous Strauss horn concerto (#1). As you can see it is almost entirely made up of various settings of a Bb arpeggio and various scale fragments. But is it not just standard classical literature that follows this pattern. 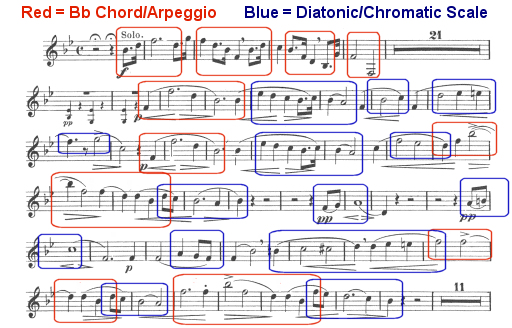 If you look at the theme & variation solos we often play they are built largely the same way. And Matia, Arban, Clarke, etc. did not write there technical showpieces in 6 flats or 6 sharps. To jump into those solos you can usually find comfort if you know your concert Eb, F, and Bb scales (T.C. = F, G, and C) with some instances of Ab or Db (T.C. = Bb or Eb). Going into more diverse repertoire you will find similar comfort knowing the more difficult scales. Think of Carnival of Venice, for example. Most of the versions we play are in Eb concert (T.C. = F). The Manning version that Harold Brasch used is in Bb concert (T.C. = C). Consider the notes you encounter. Most fall within the fundamental scale, with a few chromatic alterations as passing tones or "returning tones." Most places in the Clarke/Arban versions when you see a written D (T.C. = E) you don't need to stop and wonder if it is natural or flat if you know the Eb (F) scale - it is a natural in that scale. Below is the Strauss horn concerto opening. The outlines show how much this relies on scales and chords. I'd like to record that someday, but in the meantime I recorded two very direct examples. The first is "A Groovy Kind of Love" by Toni Wine and Carole Bayer Sager, made famous on the pop charts by The Mindbenders. As you can see in the opening phrase below, the piece is entirely connect notes from the scale (or repeated notes) until the first jump between notes 31 and 32! It is the most obvious example I can recall from the top 40 charts, but of course Christmas carols like "Joy the the World" and "The First Noel" are also very scale dependent. The next example is one I wanted to record regardless of this post's focus on scales and arpeggios. It is the theme from the "Tammy" movies (music by Jay Livingston and Ray Evans), which stared Debbie Reynolds and later Tuesday Weld. This song spent time in the top 40 as well. It is a very simple, but very pretty song. Notice the use of arpeggios in the opening.